The good thing is that the servicing is super easy when it comes to cleaning your car’s fuel injectors. Many oil and additive manufacturers offer chemical solutions to clogged fuel injector. Drivers can easily purchase a fuel injector cleaner online and at almost every gas station. These additives can prolong your car’s life cycle, increase the mileage and help get the most power from the engine. The biggest problem can be choosing the best fuel injector cleaner for your vehicle. If you’re wondering what is the best fuel injector cleaner, worry not, we’re here to help. We bring you the best fuel injector cleaners – top ten. Compare the quality, prices, performance and many more. Read on and find the best fuel injector cleaner for your car. We will now review the best fuel injector cleaners available on the market at the moment. The reviews will explain in detail what each product does and what's the best way to use it. You will also find out how you can apply fuel injector cleaners as well as how much they cost per ounce. This fully synthetic fuel injector cleaner is one of the high flyers in the industry. This is a 3-in-1 solution to pollution. The manufacturer even went that far that they offer cold statistics and numbers. They claim that your car’s mileage will improve by 3.2% and that the horsepower will increase by 2.6%. It doesn’t stop there. They also claim that the emissions will be reduced by 12 to 18 percent as well. Now that is a big deal if you’re about to take your car for the emissions testing. It even goes well with biofuels. This additive should also offer smoother ride and better throttle response. It is also recommended that you add it to the fuel if you’re going to store your car for longer periods of time, since it stabilizes the fuel. The Royal Purple Max-Clean fuel injector cleaner can be used on both petrol and diesel engines. The use is really easy. Just pour it into the car’s fuel tank when the fuel level is low, then fill up the tank and that’s it. The recommended dosage is one ounce per gallon of fuel and it should be used every 10 000 miles. The Sea Foam SF-16 has many uses when it comes to cleaning your car’s fuel system. It can be mixed with both oil and fuel in order to efficiently clean all the residue that has accumulated over time. 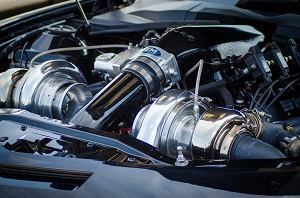 If you mix it with fuel, it will definitely help clean the fuel system, but for the most efficient cleaning of the fuel injectors, it is recommended that you pour it directly into the cylinder intake. The process is not that complicated, but if you’re unfamiliar with the vacuum lines of your car, it is recommended that you take your car to the mechanic. On the other hand, if you mix Sea Foam SF-16 with the fuel, it will provide lubrication to the system and help stabilize the fuel. The product will liquefy all the residue and carbon buildup which can then easily be flushed out of the car’s system. Another great thing about this product is that it can be used on both petrol and diesel engines. You can also use Sea Foam as fuel injector cleaner on bikes, tractors, lawn mowers etc. It is an extremely versatile product that can even help restore old engines if they are not too worn. Although some state that it should be used more often, it is usually enough to use it with every oil change. You can use it before the oil change and then just flush all the residue along with old oil. Made in America, this fuel injector cleaner is highly popular with mechanics and fleet owners. Why? Because it comes in a large container which provides enough content for mixing it with up to 400 gallons of fuel. Lucas 10013 fuel injector cleaner is intended for use in both diesel and petrol engines and it is suitable for almost every engine type. The additive solves low sulfur problems in the fuel and it mimics the lead when mixed with fuel. This can help with passing the vehicle emissions test since the fuel is being burnt more efficiently. Along with efficient cleaning of the fuel system, it will also extend the car´s lifespan. This product is a fuel injector cleaner and fuel conditioner all in one. It will also lubricate the car´s pump and the whole fuel system, improving efficiency and lifespan. The recommended dosage is 2-3 oz per 10 gallons, but another great thing about the product is that it will not harm your vehicle if you add too much. You can almost add as much as you want, but it is usually not necessary to add more than the recommended amount. Liqui Moly is a well-established brand that has been around for a while now. This German brand is one of the famous ones when it comes to car maintenance. Their product for fuel injector cleaning, Jectron, is certainly one of the most appreciated on the market. Designed specifically for petrol engines, it helps rejuvenate the car´s fuel system. Jectron fuel cleaner is a handy product that can be easily added and mixed with fuel. All you need to do is pour it in your car’s petrol tank and you’re good to go. This is a great product to use if your car hasn’t been driven for a while. It is designed to cope with the heavy buildup of dirt on the fuel injectors and it does exactly that. You can expect better engine performance, higher mileage, and lower emissions once the product is done cleaning your car's fuel system. The effects should be obvious within a few days of use. The recommendation is that you use it every 2000 miles or so for best results in keeping your car´s engine components nice and clean. With recommended use, your car should have better throttle response, smoother idling and lower carbon emissions, which then helps if your car is due for emissions testing. The BG 44k fuel injector cleaner is another popular solution that has been around for a while. It helps restore your car's performance in a short period of time. This product contains no alcohol and is, therefore, safe to mix with other additives as well. It is intended for use in petrol powered cars. This fuel injector cleaner will easily remove all the deposits in a very short period of time. Power loss and engine stall will be a thing of the past after BG 44k fuel injector cleaner is done with its work. The recommended use is 11 oz per 20 gallons of fuel. The effect of the cleaner should be evident almost immediately. Due to its content, BG 44k will also improve fuel and oil flow, along with cleaning the fuel system. It may be a bit on the upside when it comes to price, but it should be well worth it. If you want to see immediate results, this would be the cleaner to go with. It is also safe to use if your car has a catalytic converter or an oxygen sensor. The Chevron Techron Concentrate Plus is another popular product among automotive enthusiasts. It is an additive that will clean the car’s fuel system completely, ensuring best possible performance after just one application. This is the fuel that uses polyether amine technology to offer best results. The PEA technology will efficiently remove all the deposits on the fuel injectors and the engine. It is especially effective in removing residue caused by sulfur. You can expect this product to improve fuel economy, restore power and acceleration and help the car perform better in general. Some user even report that their car’s fuel economy has increased by as much as 10 percent after using the product. The Techron is designed to be used with petrol powered vehicles and it is not recommended for diesel engines. It can also be used with ethanol fuels. The manufacturer recommends that you use it every 3000 miles, or at every oil change. You should definitely follow the recommendations since the product is extremely strong and if you overdo it, you might end up with damaged fuel lines. If you use it properly, you don’t have to worry that it will damage the sensitive parts of the engine. The manufacturer even states that Techron is actually perfect for the maintenance of these sensitive components if used as recommended. ​Redline SI-1 cleaner is a product that prevents further build-up of dirt and moisture after it cleans the fuel system. The peculiarity of this additive is that it uses only 50% of Polyether Amines in its content, making it extremely efficient. This is confirmed by the Material Safety Data Sheets. The other part, the synthetic blend, helps lubricate the engine parts and preserve them from further harmful effects. By applying the Redline fuel injector cleaner, overall engine performance and fuel economy will be restored. It is designed for petrol engines and it is not recommended to be used with diesel engines. The manufacturer claims that the cleaning efficiency is almost 100 percent in just one treatment of the car’s engine. They also claim that it will reduce the octane need by up to two points. The recommendation is to use one 15 oz bottle per tank. They also state that it is safe to use repeatedly, so you can add it to every full tank refill. Another great thing is that it is designed to withstand great temperature differences. It copes well with the lowest as well as with the highest temperatures. Finally, one made especially for diesels. This fuel injector cleaner is intended for diesel engines only and it provides cleaning of the tank, fuel injectors, and the fuel lines. The trick is that it helps diesel to burn better and more efficiently. It also creates a protective coating inside the tank and the fuel lines, protecting them from any damage. When it comes to diesel-powered cars, Hot Shot's Secret is surely one of the best fuel injector cleaners on the market. Many use it as prevention and it seems to work well for them, but it will also help if you need to “repair” your car a bit. It is also said that it will improve the car’s mileage if used as recommended. The recommendation is to use it every six months and you shouldn’t use it more than once within the six months. The manufacturer also states that the product will improve throttle response, eliminate black smoke, reduce DPF regeneration and improve fuel mileage. The product contains what they call “a highly effective fuel stability package” and this is supposed to be responsible for the power upgrade of your car. One 16 oz bottle is used to treat 40 gallons of diesel. ​This fuel injector cleaner is one of the longest lasting ones on the market. This product, according to the manufacturer, will provide engine protection for two years. Now that is something that can be really useful if you don't want to think about adding cleaners to your fuel very often. The enzyme technology promises great results when it comes to dissolving the build-up of dirt in the fuel system. Star Thone Enzyme is intended for petrol cars and it shouldn’t be used in diesel engines. The recommended dose is one ounce per six gallons of fuel. The price may seem a bit too high to some, but when you take into consideration that it protects your car for two whole years, it actually isn't much of an expense. It can also be used on other types of vehicles, not just for the car engine. The product is great for cars that are used every day, as well as for the cars that you are planning to leave undriven for a long time. If you’re planning to store your car for a while, mix the additive with fuel before storing the car. This will ensure that the fuel will keep its power and you shouldn´t have any issues starting your car at a later time. ISO-HEET is a versatile product that works as a fuel injector cleaner, as well as an antifreeze and water remover. Along with cleaning your car’s injectors, it will remove the excess water and humidity. This process then ensures that the fuel will be richer and it will burn much better. If you live in a colder climate, this product is the right one for you. Mix it with fuel and it will help maintain burning quality by controlling the fuel density at low temperatures. It will also effectively prevent rust and buildup thanks to its water removing capabilities. This additive can be used with both petrol and diesel powered engines. During the winter, the manufacturer suggests that you use ISO-HEET with every full tank. In general, you can use this product every 5000 miles for optimal results. If you need a product solely for the purpose of fuel injector cleaning, you might want to pass on this one and get one of the other products on our list. The product is great if you want an all-round solution in the winter. If you live in the area where winters are long and harsh, then you should definitely give ISO-HEET a chance. Among these ten, you will certainly find one that fits you best. We’ve tried to explain the benefits of each individual product in the best way possible. Our top overall recommendation is Royal Purple Max-Clean Fuel System Cleaner and Stabilizer. It is the most versatile product in our opinion and at the price of $0.51 per ounce it sits somewhere in the middle of the price range. It is a great product if you want to clean the fuel injectors and it helps stabilize the fuel if you’re going to leave your car in the storage. It is intended for both petrol and diesel cars. Second is the Sea Foam SF-16. The product is one of the top rated ones on Amazon and we simply cannot overlook that. It seems to be very popular and versatile product. It can be applied directly to the injectors or mixed with fuel in the fuel tank. It cleans and lubricates, which then prevents future dirt buildup. It can also be used with both diesel and petrol engines. Third place is the product that shares the lowest price with ISO-HEET. Our third pick is Lucas 10013 fuel treatment. It sits at just $0.19 per ounce, making it one of the two cheapest options here. For this reason, it finds its use with those that own a lot of cars or own a company fleet. It comes in one-gallon packing and therefore offers long-term dose. One gallon of this product is enough to mix with 400 gallons of fuel. As is the case with the previous two, this product can be used with both diesel and petrol cars as well. It is also one of the best products to use prior to taking your car for the emissions test. The prices, of course, vary from brand to brand. The amount of cleaner you get per packing also varies and many offer several options. The right value can be determined if you check the price per ounce for each product. The info below will provide you with the answer. The best value on the list are ISO-HEET 28202 Premium Fuel-line Antifreeze Water Remover and Injector Cleaner and Lucas 10013 fuel treatment. Both go for $0.19 per ounce. The most expensive option is Liqui Moly 2007 Jectron Gasoline Fuel Injection Cleaner at $1.08 per ounce, followed closely by Chevron 65740 Techron Concentrate Plus Fuel System Cleaner and BG 44k fuel injector cleaner sitting at $1 per ounce. You can check the table below and compare the prices of all the products. If you choose to go with the crowd, this might be the right product for you. Many seem to be really satisfied with Sea Foam SF-16 performance when it comes to cleaning the fuel system in general. The product has an advantage in the fact that it can be used for both petrol and diesel vehicles, and not just for the cars. Maybe this is the secret behind the high number of reviews. People seem to use it for boats, lawnmowers, tractors and other vehicles. As we’ve already mentioned, you can’t go wrong with any of the products from our list, but if you choose to go with the most popular product, the Sea Foam F-16 is the answer. If you’ve already decided to go with Sea Foam SF-16 after reading the most reviewed section, we are sorry to bring you into a dilemma with Lucas 10013. They are both at a really high rating and seem to be quite popular. You probably won’t make a wrong decision whichever way you go, so maybe the price will help you decide. In the next section, we will explain how much do you exactly get for your money. As you can see there are many brilliant and versatile products available if you’re searching for a good fuel injector cleaner. Each of the products listed here found their place on the list for a reason. We can safely say that ALL of the products reviewed here are actually great products that will certainly help with the car maintenance. But, you probably came here because you are going to buy only one and you wanted to do proper research before the purchase. Luckily, you came to the right place. Our experts have decided that the best fuel injector cleaner is… *drum roll please*…yes, it’s the Royal Purple Max-Clean. The reason why we chose this product as our overall winner is simple. It offers everything you need form a fuel injector cleaner and more. The 3-in-1 approach was the tiebreaker for us. It will improve the car’s mileage, it will increase the horsepower and it will reduce the harmful emissions by 12 to 18 percent! Another thing that pulled us toward this product is the fact that the manufacturer displays the numbers and the percentage openly. Not many manufacturers will be that bold to claim the exact figures when it comes to your car’s overall improvement when you use their product. You can use it with almost every vehicle, petrol or diesel, too. It is a great solution if you want to store your car for a longer period of time as well. The use is super easy, just pour the content of the can in the tank…every 10 000 miles! Yes, another big plus. You don’t need to use it with every fill-up, or every two or three thousand miles. Every 10 000 miles will do the trick. It is clear then why we think that the Royal Purple Max-Clean is the best fuel injector cleaner available on the market right now. We are certain that this product will help restore your car’s engine to its former glory. Hot Shot's Secret P040432Z Diesel Extreme Clean and Boost is the only item on our list that is created exclusively for diesel engine cars. This diesel fuel injector cleaner is the number one best seller on Amazon when it comes to diesel only additives. That suggests that people actually trust the product and use it quite often. The Hot Shot's Secret will clean the entire fuel system of your car, including the fuel lines and the tank. It can be used as a prevention method or if you need to revive the engine a bit. It also doesn’t require frequent use, which is great if you don’t want to be thinking about adding stuff to your fuel with every fill-up. You can mix it with fuel every six months and it isn’t recommended that you use it more than once within six months time. 16 ounces will be enough to treat 40 gallons of fuel. The manufacturer promises that it will get rid of the common diesel issues like black smoke or DPF malfunction. They also claim that it will help your car by increasing the power and mileage as well. So if you drive a diesel and are looking for a diesel only fuel injector cleaner, Hot Shot’s Secret is the product for you. It is always important to know how you should clean the fuel injectors on your car. Depending on the fuel injector cleaner that you choose, or the car you drive, the cleaning process may differ. We’ve prepared some top tips to help you with the process once you’ve purchased the fuel injector cleaner and are ready to go. 1. The first thing that you need to make sure is if your car’s fuel injectors even need cleaning and if the car manufacturer recommends that you shouldn’t use additives in the engine. Some car manufacturers clearly state that the warranty will be void if you use anything else except fuel in the car’s fuel tank. Read the car documentation carefully before deciding to clean the fuel injectors yourself. 2. Apart from adding the additive in the fuel tank, you can also clean the fuel injectors directly. If you detach the hose that leads to the intake, you can feed the cleaner directly onto the injectors. Don’t forget to check if the product you’re using is intended for this kind of application or if it should be mixed with fuel. 3. If you decide to go with the above technique, we advise that you wear protective equipment for your face and hands. Wear gloves and goggles, or even a face mask if you can. Many of these additives can cause serious damage to your skin and eyes. Some of the chemicals can even cause permanent damage. You also need to keep in mind that the contents of the fuel injector cleaner can be flammable. Make sure that there are no leaks and that the pressure is right. Safety first, always. Many claim that using the fuel injector cleaner is unnecessary. They say that modern fuels already contain everything needed to keep your car’s engine run smoothly. Others claim that fuel injector cleaners cannot harm your car, but only help it. We say it’s up to you to decide based on which car you drive and how many miles are on the clock. The general rule on when to use a fuel injector cleaner is when it’s needed. If you feel that your car has lost power, smokes too much or just doesn’t run smoothly, you may want to check the condition of the car’s fuel system. If there is too much dirt on the fuel injectors, they can cause the above-mentioned problems. The fuel injector cleaner should be the first thing to resort to in this case. It is by far the cheapest option and it could solve the problem. You can’t make it worse. If the additive doesn’t help, you’ll take the car to the mechanic anyway. You should try the fuel injector cleaner for a few thousand miles and carefully monitor if the car performs better, same or worse. This depends solely on the product you go with. Some products will require a more frequent use, for example, Liqui Moly 2007 Jectron should be used every 2000 miles for best results. Others will not require frequent use, like Royal Purple Max-Clean that requires being used every 10 000 miles. The decision is up to you. If you feel that more frequent use will be a better solution, you can go with that kind of product. If you want to add it once and forget about it, then you should get one of the products that you don’t have to use as frequent. When it comes to dosage, this will also depend on the brand. All of the brands have a recommended additive to fuel ratio. Hot Shot's Secret, for example, states that the 16-ounce bottle is to be mixed with 40 gallons of fuel for best results. Every product will have the recommended dosage written on the label so you don’t have to guess how much fuel injector cleaner to use. Some also claim that it will not harm your vehicle’s engine if you add a bit more than the recommended. As you can see, choosing the right fuel injector cleaner is not as easy as it may seem. People tend to think that it doesn’t really matter which one you use, but it is obvious that a lot of research needs to be done if you want to be sure that you’ve got the right product. You must take different factors into consideration in order to know what fits your car best. It is necessary to know what you expect from a fuel injector cleaner. Some will be great for cleaning right away, but may not offer protection over alonger period of time. Some products will clean the entire fuel system of the car, not just the injectors. If you’re not going to use your car for a while and you want to store it, then you must choose the best fuel stabilizer. If you’re about to take your car to the emissions testing station, you’ll want the additive to reduce the emissions as much as possible. Considering all of the above, you now realize why we’ve picked Royal Purple Max-Clean Fuel System Cleaner and Stabilizer as our overall winner. The product simply seems to offer everything you would expect from a fuel system cleaner and more. The price is highly competitive as well, especially when you see what you get from it. No matter which of these products you pick, you should be satisfied with the results. But please make sure to inform yourself what exactly you need from the product. Once you know what you want, it will be much easier to choose the right fuel injector cleaner. We certainly hope that this fuel injector cleaners review will help you get informed and make the right decision. Feel free to look around our website as well. We are sure you will find some useful info on emissions testing for your area, or maybe read another review that will help you with car maintenance. If you have any questions don’t hesitate to send us an e-mail and we’ll be more than happy to help you out.